The Digital Negative Second Edition is about raw image processing of digital camera captures. It details what makes for a really good digital negative and how to harness the massive power of Lightroom and Camera Raw to extract the best-possible raw rendering of that digital negative. It’s also about when and how to deploy Photoshop to take your rendered digital negatives further using the power of Photoshop to perfect the images that need and deserve the attention. I drill down on the Lightroom Develop module and the Camera Raw plug-in extensively—that’s the meat of this book. While parametric image editing (editing the parameters instead of the image pixels in Lightroom and Camera Raw) has advanced considerably since Camera Raw was first introduced, there is still a use for that venerable old lady named Photoshop. 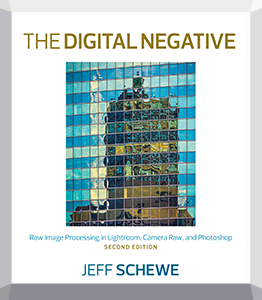 The newly updated Second Edition of The Digital Negative includes new content to cover new features that have been added to Lightroom, Camera Raw and Photoshop. The software versions used in the book were Lightroom CC 2015.1, Camera Raw 9.2 and Photoshop CC 2015.2. Click here to download a PDF of the table of contents and the full introduction. Note: for best viewing, use Acrobat and set the Page Display in the View menu to Two Page View and check the option to Show Cover in Two Page View to make sure the spreads display correctly.